Don’t have the time for a weeknight or weekend Intramural? No problem, join us for one of our fun Lunch Special Events. This events occur on Wednesdays, from 11am-1pm in the North Gym throughout the school year. Pop by with your friends to test your skills, have fun and win some great prizes! Open to all. No registration to be filled, no fees to pay, just come to the gym to get active and participate! Join us the in the Atrium at EDC for the Pop Shot Challenge. Just like at your favourite carnivals and arcades, challenge your friends to see how many shots they can make in 30 secs. How many free throws can you make in a minute! 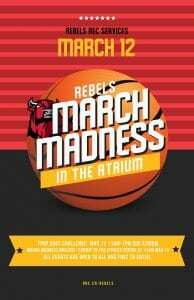 Catch March Madness in the North Gym and have some fun at lunch! Sign Up for the Rebels Stanley Cup Bracket Challenge! 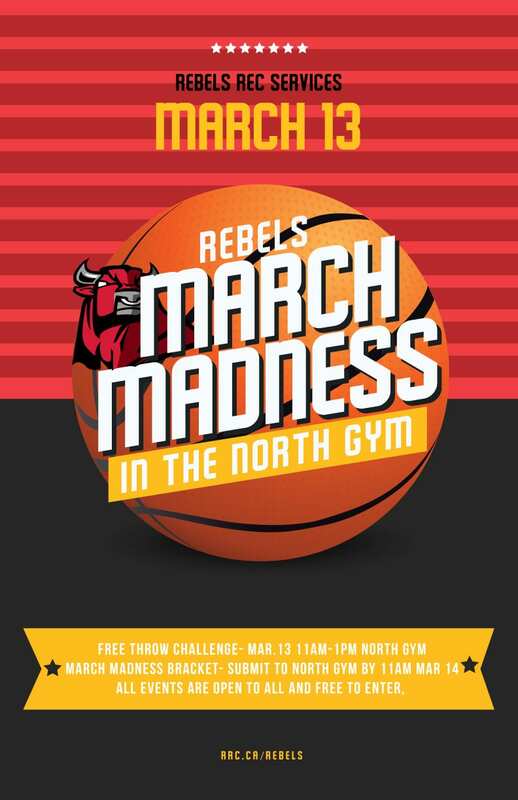 Red River College > Rebels United > News > Fitness > March Madness at RRC!